Move a tablespace between Oracle database version 11gR2 to 12cR1 with the fastest method between Oracle databases using the transportable tablespace features. Autorisation de privileges (GRANT) acceptee. The DBMS_TTS package checks if the transportable set is self-contained. La version de fuseau horaire source est 14 et la version de fuseau horaire cible est 18. 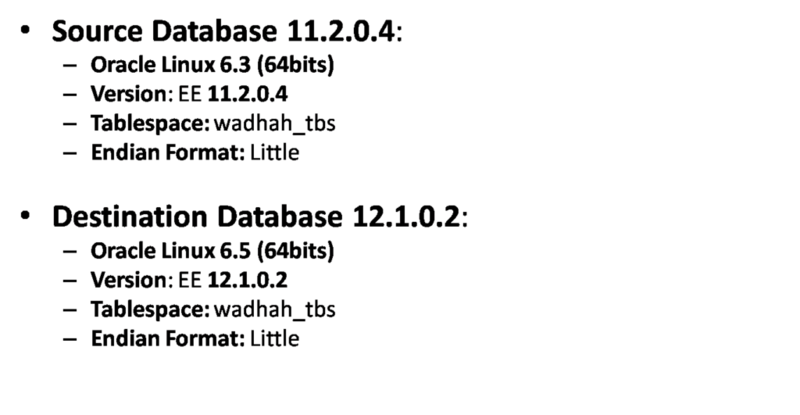 Move a tablespace between Oracle database version 11gR2 to 12cR1 with transportable tablespace .